I haven't given an update on some of my knitting projects, so I thought I better take a few pictures and start sharing. The heat seems to have broken as well as the humidity. 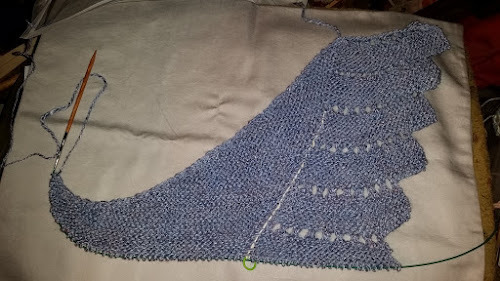 So while I will soon return to finishing the Baby Hap for my grand niece, the Purple Princess, I want to spend a day or two more on my most recently active projects. 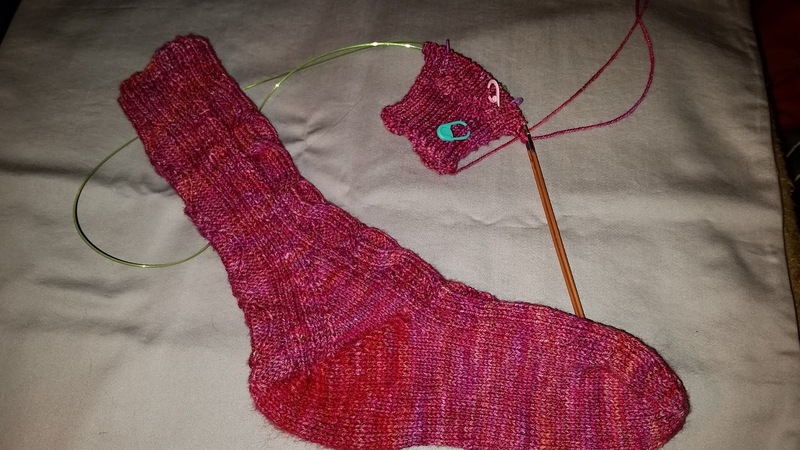 I haven't been able to work much on the Cactus Flower Gold Digger sock. The gloomy days recently hindered much in the way of chart reading. 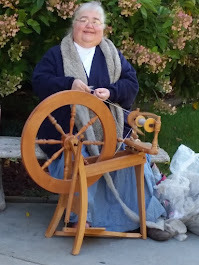 I have only done a few of the charted rows. I recently put it in time out also. Lewie, the black fuzzy cat kept jumping on my shoulder in spite of the humid weather. I did convince him to sit on my lap. But when he jumped off, his leg was tangled in the needle loop. And he pulled half the stitches off. Well in all fairness, it was the needle he pulled out, not the stitches. After much patience, I managed to replace all the stitches, and salvaged the cable twist intact. Whew. My Simple Brainless Sock is at the end of the leg and I have started the gusset. 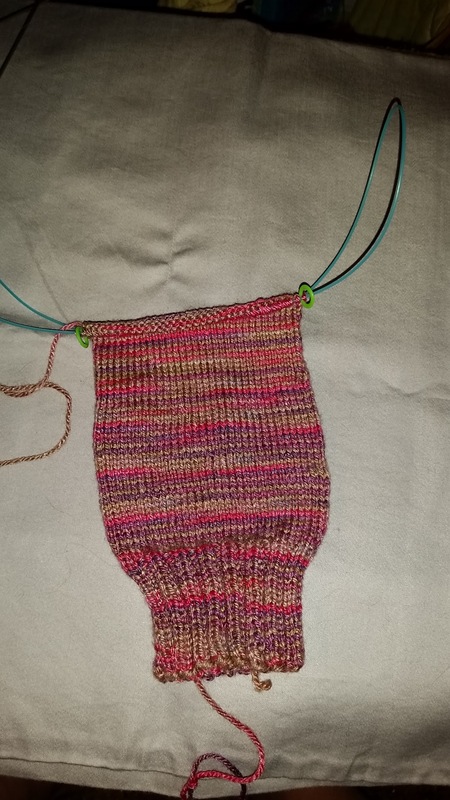 Since I am again working a Fleegle Heel, as on the Gold Digger, I do the gusset first and then turn the heel. And the Close To You Blue Shawl grew quite a bit during my trip up north to the fiber festival and after. I think I may have accidently started making an extra two garter rows between decrease rows. But I am being consistent, so all is good. Never let the actual pattern get in the way of a design element, I always say. On the non-knitting front, I made a batch of laundry sauce. It isn't lavender because I could not get any lavender Purex crystals, but this scent, whatever it is, is pretty good. 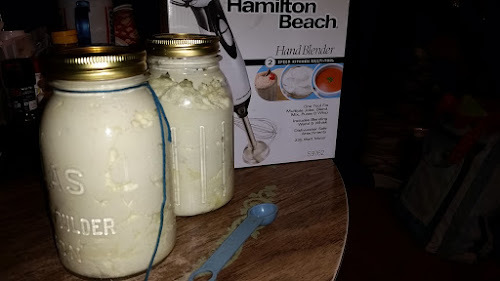 Since I don't have a regular blender, I had recently got a stick blender so I could whip this in the quart jars. But, unfortunately, the blender won't fit into a regular mouth jar. I managed to dump it into a metal bowl and it whipped up fine. Messy, but fine. Note to self, get my hands on a couple wide mouth jars before my next batch.